We’ll be watching the subtitled versions and discussing them here every week without spoilers for future episodes. But if NERV fails, it means the end of the world. A sentence said by a character we don’t know to Kaji, a character we barely know. This episode is okay. Since Asuka’s appearance, the tone of the show has shifted a lot, and I’m not convinced it’s been productive. 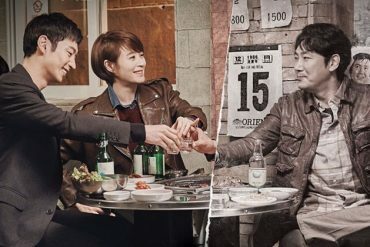 Like the previous couple episodes, this is another monster of the week structure, with plenty of humor thrown at the viewer. The thing about Asuka: I like her. I like what she adds to the relationships, even so far. I like how she pulls the show out of this constant sense of peril. But, at the same time, there’s a weight that feels absent from the show since she arrived. I mean, this is the end of the world they’re playing at. The stakes are high, and it sometimes feels like that gets lost. Which is both good and bad, I think. Because people need to live, yeah? They’ll find a way or be crushed by the looming apocalypse. They’ll find humor and playfulness and ways to keep on living brightly, even in the final rays from the sun. Before her, everyone’s suffering in their own way. Asuka clearly has some issues, but they’re more normal. The anxieties of her own worth as a person, as a woman, as a pilot. Her anxieties are more on the surface, whereas Shinji and Rei’s are so deep and dark and contained that it makes them difficult to relate to at times. But Asuka is a much more typical teenager, even though she’s a university graduate at fourteen, an EVA pilot, a NERV soldier. She manages to be all these things, and she pulls Shinji into a new realm of relationships. With Rei, it’s kind of a mutual misery and brokenness they share. With Misato, it’s kind of a relationship siblings who’re a decade apart might have. With Asuka, there are a lot of elements going on. It’s very much like a sibling relationship, but there’s also much more sexual and romantic tension between them than there is with any of the other women in Shinji’s life. Let’s be clear–Shinji is a fourteen year old boy, so he’s attracted to everything woman shaped. We’ve seen his discomfort with his own sexuality and his attraction to the women in his life. We see that in this episode at the pool and later at the hot spring. Shinji oggles both Rei and Asuka in their swimming suits. He can’t help himself, really. He’s a bundle of hormones and repression. The girls he shares the most space with are attractive and, in this moment, they’re barely dressed. So I do think Asuka adds a lot to the show, but the show begins to conform to her, I think, in ways I wish it didn’t. It becomes lighter and breezier. The Angel battles become a matter of course rather than real moments of peril. Even this episode, with all its implications about the Second Impact–we don’t feel that danger, mostly because the Second Impact is more of a shadow to us than an event. 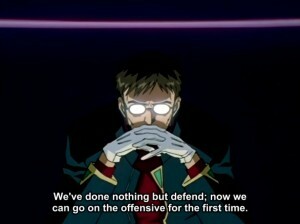 Which is also true of the EVA pilots. They were born after the Second Impact, so it means nothing to them. It reminds me of something Glenn Greenwald said about his lectures around the country a few years ago. He kept referencing the Patriot Act and how things have changed in the US since then. 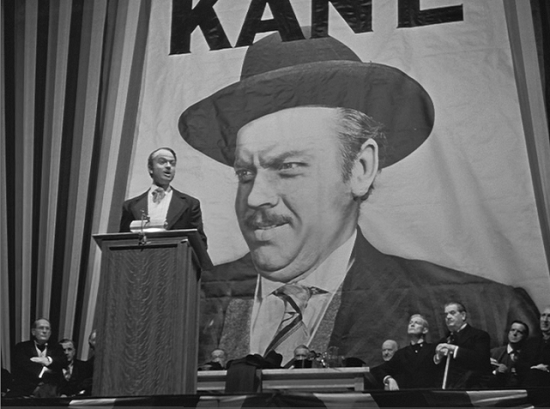 But to his audience, people who are around my age or younger–we don’t really know a world without the Patriot Act. I was fourteen when it was first signed. My knowledge of politics was, to put it mildly, non-existent. By the time I was paying attention to civil liberties and so on, I had lived for years under the Patriot Act. People younger than me would be even less aware of how things changed because they grew up in a world where the Patriot Act was always a law. Or like how when I was teaching in South Korea and all of my students were younger than the internet. Younger than Pokemon. They didn’t know a world without those things. And neither do these pilots. They don’t know a world without NERV. A world that hasn’t been changed by the Second Impact. I mean, don’t get me wrong, Asuka’s descent is pretty tense. The tension is constant, like a nagging. You feel something must go wrong, something must be perilous. Anno plays with this tension. The moment we’re breathing easy, he pulls the rug out and unleashes the Angel on Asuka. It grapples onto her EVA’s face like the Alien from Ridley Scott’s Alien. It begins crushing her EVA, and Asuka needs to science her way out. By cutting the cooling pipe and shoving it inside the Angel, thermal expansion takes over and she stabs it until it dissolves in the magma. The thermal expansion idea comes from earlier in the episode when Shinji’s studying. See, that’s part of what I mean here. The show becomes kind of typical. The dramas of middle school, the trials of homework–this is the land of every anime, basically. We have the school narrative to balance out the apocalyptic one, which creates interesting tensions, theoretically. Having to balance saving the world with bad grades from your teacher. I find it pretty uninteresting, to be honest, but it might be necessary to balance the weight. 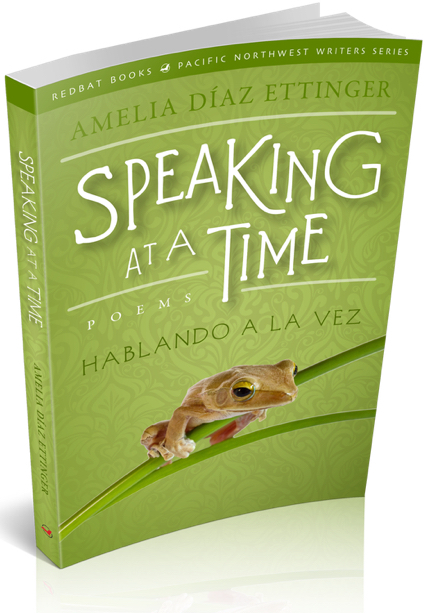 When you’re telling a story, it can’t be a nonstop sprint towards the apocalypse! You’ll burn out your audience. But the episode begins with Asuka shopping with Kaji, searching for the right beach gear for her school trip to Okinawa, only to be told by Misato that she and the other pilots aren’t going on the trip. We get more of that family humor and tension that happens in every scene at Misato’s apartment. Misato is their guardian but also only a decade or so older than them. She’s also their commanding officer and a hard drinking slob they share a bathroom with. So Misato is somewhere between an older sister and a mother to them, and so Asuka pushes. She’s an Alpha, yeah? She’s used to attention and pushing through social obstacles. Everyone comments on her beauty, and she uses her beauty to get her way, but she’s also clever and strong willed. She doesn’t simply accept what an authority says because they’re an authority figure. Which is the polar opposite of Rei and Shinji, but kind of similar to Misato. Everyone treats Misato as a beauty but she’s also strong willed and clever and pretty brilliant at her job. This episode is, in many ways, about the developing sexualities of the pilots. We talked about Shinji, but Asuka’s in the same place. She wants Shinji to watch her. She demands that he watch! Sure, she’s probably not wanting him to look at her sexually, but she wants his attention. She wants Kaji’s attention. Kaji’s an adult, at least a decade older than Asuka, so he makes nothing of her advances. But she wants him to desire her, I think. She’s fourteen! She’s also a bundle of hormones and sexual impulses! It might be obvious that an adult man would reject her sexually, but to her, she’s more or less an adult. She’s a university graduate. She’s an EVA pilot. She, like all the EVA pilots, inhabit this weird middle ground where they’re expected to save the world and be adults but are still stuck in their teenage bodies, their teenage brains. 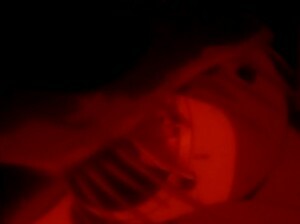 It’s Asuka’s attraction to Kaji that makes her hide from him when she’s in the thermal plug suit. It balloons her, erasing the actual shape of her body, turning her into a ball of red, like the blueberry girl from Willy Wonka. She can’t let him see her like that, ugly and formless. It’s only when Rei accepts the task that Asuka jumps back in. She, more than anyone else in the show, sees everyone as competition. She sees Misato as competition for command of the apartment. She sees Rei as competition for recognition as a pilot. She sees both of them as competition for Shinji’s attention. And she sees Misato as competition for Kaji’s love and sexual interest. When she’s about to dive into the magma in search of the Angel, she discovers that Kaji isn’t even there, and he was the whole point she took on the task! It’s frustrating to be a teenager. But we see how she looks at Shinji with tenderness and maybe love when he saves her after she destroys the Angel. It may only be the tenderness of friends or siblings, but it’s probably not that simple for Asuka to say, given the flood of hormones and the proximity of Shinji in her life. Storyline B has to do with the Second Impact and this Angel pupa. A probe discovers some seismic peculiarities at a site, so Misato goes to investigate. It’s deep in the earth, in lava. The probe goes as deep as it can until it implodes from the pressure. In its final moment, it captures the signal and image of the Angel. 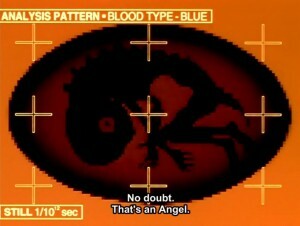 Because it’s a pupa still, NERV wants to capture it and study it before it emerges as an Angel, fully formed and deadly. Commander Ikari discusses this with the secret council he sits on, the one we’ve seen before. There’s a lot of fear with this moment as they come to understand what Ikari plans on doing. This is something mentioned just a few scenes before this. When Misato forbids Asuka and Shinji from their class trip, she explains that an Angel attack could happen at any time, which is why they need to stay here, on alert. 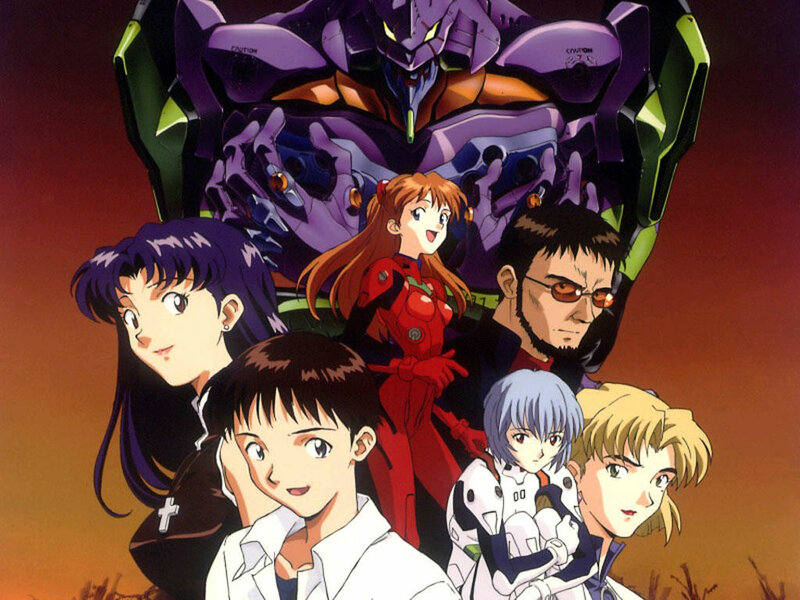 Asuka’s frustrated that NERV doesn’t know when Angels will attack and Misato shares that frustration. But that’s something we discovered a few episodes ago. The Angels share a lot of commonalities with light, in that they’re wave particles, more or less. Giant powerful photons. It’s probably why they’re almost never seen until they’re smashing Tokyo-3. 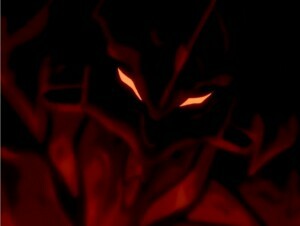 But here, NERV has a chance to bring the fight to the Angels. The council reminds Ikari what happened fifteen years ago, the implication being that this was how the Second Impact happened. Which means, if this is true, that humans caused the Second Impact. It wasn’t simply an Angel attack. It was a pre-emptive strike–like the one they’re planning–on an Angel. And, if we remember from episode seven, Kaji gives Ikari what he describes as the First Human, Adam, and it looks a lot like this Angel pupa. So this storyline B is full of mystery and implication, but all of it’s conjecture right now. We simply don’t know enough to even really say what we know. After Asuka defeats the Angel, storyline A and B becomes the same one, as we see the way Asuka looks at Shinji. Misato: If we failed, there’d be another one. Ritsuko: Yes. Second Impact…I don’t want that again. So even though we didn’t feel that fear the way the characters did, it looms large. Something could have happened here. Something disastrous. And then we go to the hot springs where Shinji overhears Misato and Asuka bathing one another and his erection startles Pen Pen. Embarrassed and ashamed, Shinji shrinks into the water, his erection still growing from what he imagines the two naked women are doing. 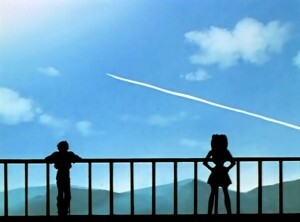 But then we go to Asuka and Misato, sitting in the bath, staring at the sky. We see a scar on Misato’s chest. She says it’s from the Second Impact. We found out earlier that Kaji’s class trip was canceled due to the Second Impact. What this means is hard to guess. But Misato, Ritsuko, and Kaji are old friends. As far as we know, only Misato was harmed by the Second Impact. And we don’t even know what that means. Was it a side effect of being close to the Impact? Was it simply something that happened around that time? We know they lived through the Second Impact, that they were just kids, but we don’t really know anything else. They could’ve been thousands of miles away or right on top of it when it happened! But that’s what we’re left with. Shinji’s shame at his own erection, his own sexuality, and Misato’s scar from the Second Impact.